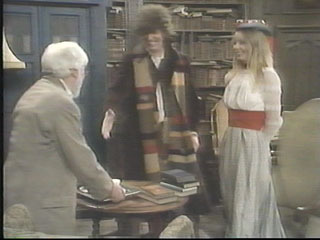 Story: The Doctor, Romana, and K9 pay a visit to an old Time Lord friend living under the alias of Professor Chronotis at Cambridge university. What Time Lord secrets are contained in the lost book that the Professor asks the Doctor to help him find and return to Gallifrey before it's too late? Who is the mysterious Skagra who travels the galaxy with an ominous floating ball constantly at his side? And why do people hear a babble of inhuman voices whenever he comes near? character artist Martin Geraghty and animator Anne Marie Walsh. Moderated by Toby Hadoke. production manager Ralph Wilton, production assistant Olivia Bazalgette, and design assistant Les McCullum. These days, it takes a bit of effort to keep track of all the different versions of "Shada" out there, all doing something different to try to fill in all those scenes that weren't completed in 1979. The first version that I ever saw around 1990 or 1991 deeply informed me of the original blueprint for the tale, as it presented full length text drawn from the rehearsal scripts to fill in all the missing scenes. The finished effect made it feel as though I had switched to reading the novelization each time a scene was missing, which really is the next best way to enjoy a Doctor Who story. I don't think that version has ever been made available to the public at large, certainly not in a commercial venture. Well, now we have a wonderful full-length movie version on DVD that lets us see and hear the whole story, with missing scenes animated and voiced by the original cast as of 2017. It really is a glorious effort, finally doing audio/visual justice to the full narrative. However, though it claims to be complete, sharp-eyed fans like me may notice that there are still a few scenes missing, perhaps sadly deemed unimportant. For example, there should be scenes in the TARDIS interior all throughout the story, yet the earlier ones are all missing. Episode One also features Skagra harassing the owner of a blue car, a sequence which was to feature car interior inserts from the studio. The scripted lines on location also hadn't been dubbed on properly yet. This latest movie actually presents the most incomplete version of this scene that I've witnessed yet, where the whole point of the sequence doesn't come across. ...And so I end up feeling more distanced from the visuals than I should be, all because of a simple technical mistake that lasts two and a half hours. Who's idea was it to pointlessly put a 4/3 movie inside a 16x9 VTS on the DVD disc? And ditto for all the 4/3 extras? Was this a factor in delaying the North American standard DVD release for a full year? I suppose this won't really affect anyone watching with a 16x9 screen, but it is a significant difference to the rest of the Doctor Who line. If every other Doctor Who DVD from the past 20 years could get this right, why not Shada in 2018? Curiously, thanks to yet another version of the story released on VHS in 1992 featuring narrated links by Tom Baker (which made it to DVD in 2013), we can now compare two different versions of effects, editing, and music during a certain chase sequence that should be a real highlight of the show. Watch the two side-by-side and you'll soon see what I mean, although I'll only go into deeper detail in the in-depth analysis version of this review. The 1992 version edited by Simon Ashcroft with additional effects by Ace Editing has a sense of energy and urgency that makes the chase exciting and tense. Then flip over to the 2017 version... and I'm struggling to remember why the sequence is supposed to be exciting. I'll have to give the old 1992 version the nod for being the better version at this point. I also noted how long it took for this story in general to project a sense that it was going somewhere, how long it took for it to start to really MOVE. I think I might actually prefer Keff McCulloch's original opening cue for giving the first scene a bit of marching energy. I also think the opening TARDIS scene, which is missing in this new movie, did something to motivate the many leisurely scenes that follow and hint at the plot that would unfold. The Doctor's witty exchanges of dialogue on board the invisible ship nicely get their due now. The story's completion also adds so much to the concepts that are explored in the later four episodes, where character motivations, goals, and scientific/philosophical concepts are fleshed out and made real, the dialogue painting pictures with words. Where Robert Holmes and Terrance Dicks used to do this to describe actions and events that they couldn't possibly afford to put on screen, Adams is using it instead to describe intangible ideas that even advanced CGI and post production couldn't hope to realise. He proves to be ahead of his time again. The story is not without its share of problems. The Krargs are one of them, but I'll save the discussion of them for the in-depth analysis version of this review, since too many spoilers would come out here. Christopher Neame's Skagra does not really have a chance to shine during the original 1979 footage, but his role seems to get more interesting in other portions of the script. I do think though that Neame brings a certain presence to the screen, an ominous stillness if you will, which almost NEEDS a lack of music in order to be most effective. One can see more of Neame's villainy in the second season opener of "Sliders", titled "Into the Mystic" (Sliders story no. 10), or as a Sith Lord in the PC video game "Star Wars Jedi Knight: Dark Forces II". Denis Carey was able to complete nearly all of his scenes as Professor Chronotis, easily the most memorable and beloved of his performances on both Doctor Who and Blake's 7. The humorous Time Lord Chronotis reminds me very much of Patrick Troughton's Doctor, and has a similar appeal. Shada's original 1979 footage shines brightest while developing professor Chronotis and the legends of Gallifrey. It is a shame that Carey was no longer with us in 2017 to record his few remaining lines, as they would have heightened the sense of the final clues of a mystery coming into place and getting solved. However, the new movie works quite well with its minor rewrite. Chris Parsons and Clare Keightly seem to work best while fulfilling the traditional companion role, and when they can put their considerable university educations to good use. They don't work quite as well when responding to the unknown - which they typically do with either too much misplaced emotion, or bland philosophy, or, as happened with other characters in the previous story "The Horns of Nimon", they need to catch up with the audience. A little too much screen time is spent convincing laymen that science fiction ideas are an intergalactic reality. The location filming at Cambridge is a lot of fun in itself, and highly memorable, seeming to cement the Doctor's growing popularity with young adults and university students. It's a wonder that they hadn't thought to set a story there before... or since! There is a lot to like about Mark Ayres new 2017 score, which gets better as it moves along, and gradually reveals itself to be more and more of an homage to Dudley Simpson's Doctor Who music. Most prominent is a main theme that seems to have been pinched from that same season's very popular "City of Death" story, but slightly curtailed and altered before proliferating into many different variations for all sorts of different scenes. Though very nostalgic, I admit I expected something more original. For me, the music gets more interesting and fits the picture better when we get to the later stages of the show. There is a bit more depth and power to the sound than was usual in the 1970's, while still maintaining the fun factor. The best Simpsonesque touch for me was the re-use of the fourth Doctor's theme near the end. Sweet. As a whole, the score seems to stick with a similar palette of orchestral instruments and early electronic sounds to that which would have been available to Simpson in 1979. I'm looking forward to listening more intently to it all again. And yes, I will echo the most common complaint leveled against this new 2017 version of "Shada" - it should have stuck with the six episode format. In fact, the DVD's makers haven't really given any thought to make life easier for viewers who don't want to watch all 2.5 hours of Shada in one go. There is no proper scene selection menu on the DVD. And the movie has very few chapter stops, none of which line up with the planned cliffhangers. I rarely re-watch classic Doctor Who six-parters all in one sitting, and it's a bit vexing to be so pushed in that direction here. Well, as of this new 2017/2018 version, "Shada" can actually beat "Destiny of the Daleks" (story no. 104) in the season rankings and give "City of Death" (story no. 105) a good run for its money. In fact, considering the less than great impression of time-mechanics that "City of Death" leaves us with, coupled with its difficulty in giving the Doctor solid things to accomplish at too many points... Yes, I will say that "City of Death" is effectively beaten in the rankings by "Shada", which is now in solid contention for best story of the season. During the aborted making of this story, only the outdoor location filming and the first of three studio sessions were completed. 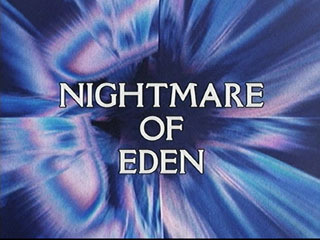 The story was not scored until the mid-1990's, when the existing footage with added special effects was linked together with narration by Tom Baker and released on VHS video. The story has never been shown on or syndicated for broadcast television. Of course, it wouldn't do to ignore that other version of Shada which, up until 2017, had been the only way for the general public to view the original footage. This abbreviated release of the footage on VHS tape in 1992 (and then again on DVD in 2013) with added music and effects, along with some extra links narrated by Tom Baker, was a brave attempt to make the original footage look and sound as finished as possible. However, it only tells the actual story adequately enough to rank it fourth out the six stories of the season. Only entering post-production over a decade after it was shot allowed the task of musical scoring to escape Dudley Simpson's monopoly and land in freelance composer Keff McCulloch's lap instead, making the incidental backing of this story far different from the usual season seventeen fare. The score sounds and works best when traditional sounding instruments like the flute come to the fore. Many scenes get a new boost with music added, such as the moment where a mid-cue switch to low piano notes adds a wonderful underlying menace to Skagra's first conversation with the porter Wilkin. Other sequences, such as the big chase, receive a necessary complement of energy from the music. But in other scenes, the music actually seems to be sapping atmosphere out of the story, and a wavering synthetic instrument in the foreground seems to be what spoils it most for me. When all is said and done, there is a lot to enjoy from this story musically. Nicely, the story is presented in its proper six episode format, taking care of cliffhangers, and all appropriate credit sequences. I don't know why this simple move escaped the makers of the 2017 movie version. However, if you've only got this 1992 version on VHS Video or DVD with abbreviated links narrated by Tom Baker, don't expect it to be quite so wonderful. A bit too much of the essential story just isn't there. 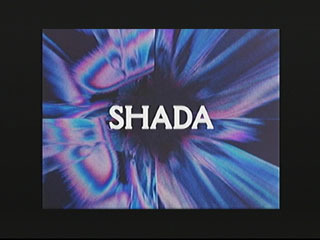 "Shada" - now digitally remastered: the version from the VHS release (109 min.) with existing footage linked by narration from Tom Baker. "Those Deadly Divas" (22 min.) with Kate O'Mara (The Rani), Camille Coduri (Jackie Tyler) and Tracey Ann Oberman (Yvonne Hartman). 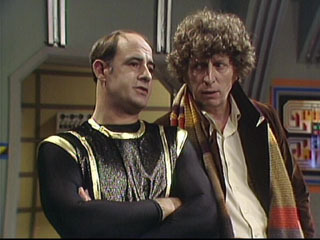 So.... How many other versions of Shada are out there? 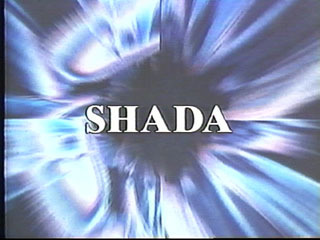 I believe the earlier text reconstruction of Shada on VHS was created privately by archivist Ian Levine before trading amongst fans caused a copy to land in my lap around 1990 or 1991. Rumour is that Ian Levine spearheaded yet another more recent attempt to reconstruct this story, which was rejected by the makers of the 2013 DVD. I have no idea how legitimate their reasons may have been, but I can't say I was very motivated in 2013 to buy a regurgitation of the 1992 VHS cassette with extras, considering how badly we all wanted to see a version of the story that was actually finished. Then of course there is another version starring Eighth Doctor Paul McGann who never really had a proper era of his own. This is included on both the 2013 DVD, and the 2017/2018 DVD/Blu-Ray packages. I can't say I'm excited about that either. So far I've only watched it as far as the pre-title teaser, a kind of fan-rambling about continuity that really takes one out of the moment and into icky territory. Sorry, "Shada" is a 4th Doctor / Tom Baker story, belonging to this precise point in season 17 of the show's chronology, and I wouldn't know how to invest in it emotionally any other way. This version's 8th Doctor retro-framing device isn't doing much to inspire me. I can say this about the presentation - It has the proper six episode format. Perhaps one needed a computer to view it from the 2013 DVD, but the 2017/2018 DVD will also play it from any DVD player onto your TV. But again, it defaults to play all six episodes in one go, with no episode selection menu or scene selection menu. On average there are two chapter stops per episode - and this time there is a chapter stop lined up in between each episode. Better yes, but still not all it easily could have been. 2017 Dec. 4 The original finale to the 1979 season has just been completed, thanks to new animation, a reassembly of the original cast for voice work including both Tom Baker and Lalla Ward, and a new musical score by Mark Ayres. 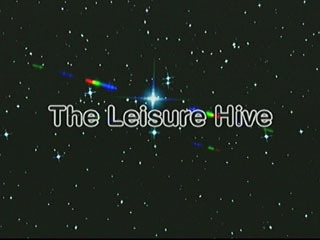 Read the Buyers' Guide Review for the next story: "The Leisure Hive"